The Voyages of Rediscovery crew are in Kettle Falls, Washington, building a cedar plank canoe for the next stretch of their journey – across the U.S.-Canada border and on to the headwaters of the Columbia River. 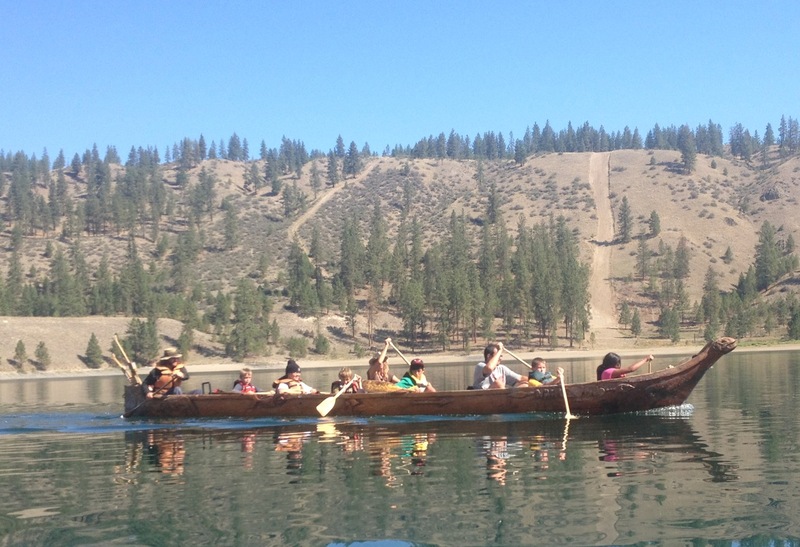 The two big dugout canoes that paddled from the Pacific Ocean were built by students at Wellpinit, on the Spokane Reservation, and Inchelium, on the Colville Reservation. Those canoes were returned to their communities in the past few days. Students paddled the Wellpinit canoe, Salmon Savior, all the way to Little Falls, the original dam that blocked salmon passage into the Spokane River. Columbia Cedar in Kettle Falls donated enough choice cedar to build the new canoe in the David Thompson style. The wood comes from a sustainable harvest under the forest stewardship program (no clear cuts). It is also the most beautiful, clear no-knots cedar we have ever worked with. So we are excited. And we invite people up to Kettle Falls Historical Center to help, learn and talk.